Those entering the city from either Pinewood Park Drive or Highway 17 will be in for a big surprise next spring. Indeed, Jerry O’Connell, the beloved actor, wrestler, and genuinely nice guy who has starred in films and shows like “Stand By Me,” “Sliders,” and “Kangaroo Jack,” will now be immortalized via two 80 foot tall murals. 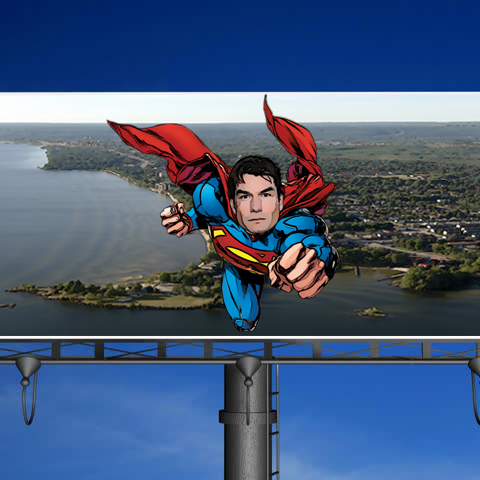 The first mural, which will feature Jerry O’Connell as a literal Superman, will be erected at the former Moe-Ze-On-Inn site. Construction will begin in January, with parts of Pinewood being forced to a single lane. “It’s a small price to pay for more Jerry!” someone shouted from the crowd Thursday. The second mural will be placed directly in front of The North Bay Regional Health Centre. Some concerns were raised over the 80 foot tall mural blocking the sun from coming into many of the Health Centre’s windows, but Councillor Tanner reassured everyone that sick people prefer the dark. The City of North Bay will be partnering with The White Water Gallery to paint the murals. Artist Kateri Beckah, known for avant-garde exhibit celebrating local rainfall in July, will lead a group of volunteer painters in the creation of the two giant O’Connells. “I’m really looking forward to painting those sweet, sweet eyebrows” Beckah told The North Bay Bay Thursday. While the first mural is a simple depiction of O’Connell as a muscular, God-like Superman, the second will be more nuanced.